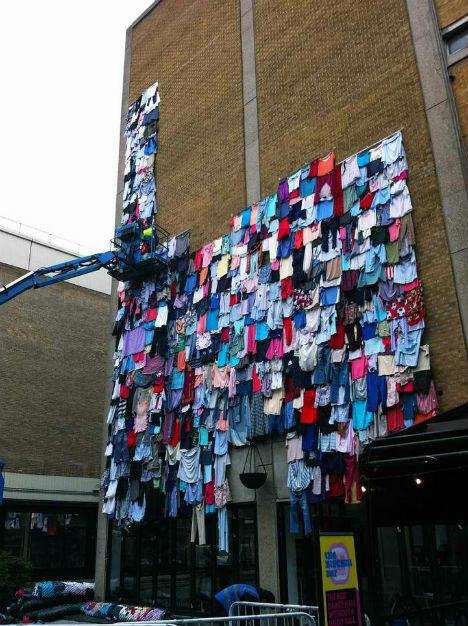 Covering the outside of a four-story building like tattered shingles, 10,000 colorful garments hang – and they represent just five minutes’ worth of discarded clothing in the United Kingdom. 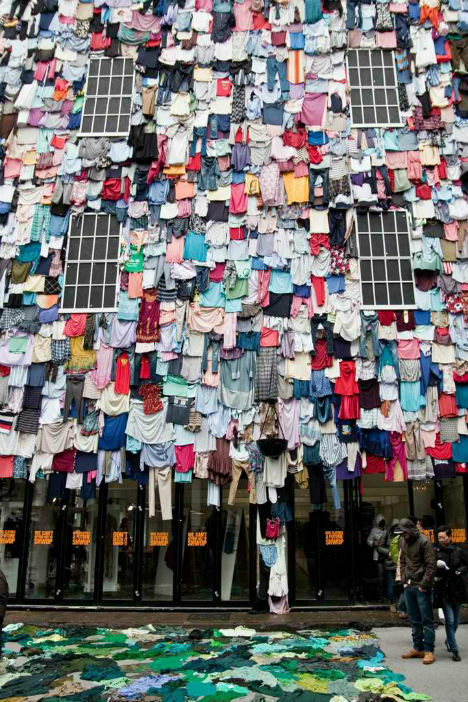 The ‘Shwopping’ campaign by UK retailer Marks & Spencer (a portmanteau of ‘shopping’ and ‘swapping’) calls attention to clothing waste in a way that temporarily transformed an urban setting in London. 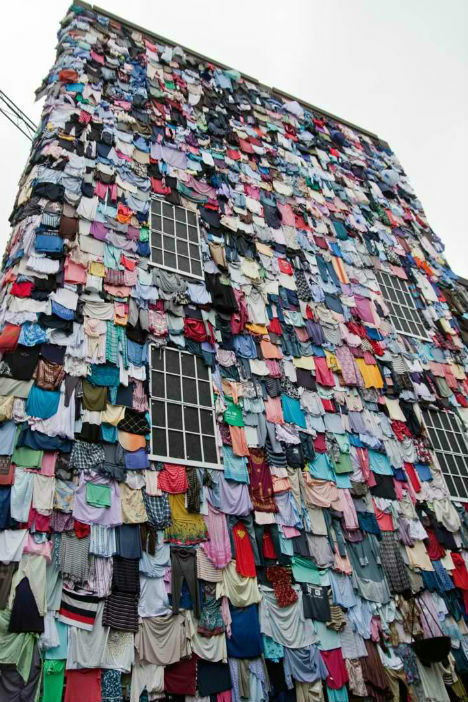 A building in East London became the basis of a massive urban art installation for the Shwopping initiative, making a visual statement that simply couldn’t be ignored. The garments were layered over each other, lending a shaggy appearance to the structure. 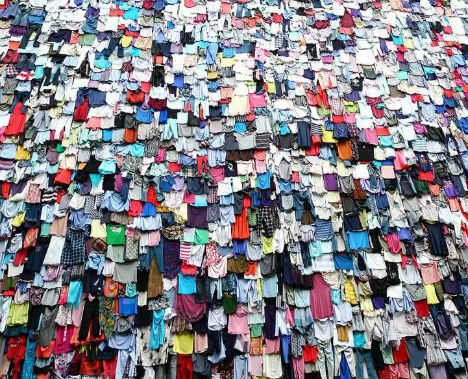 Each of these garments was no longer wanted by its owner – but that doesn’t mean that nobody else would want them. 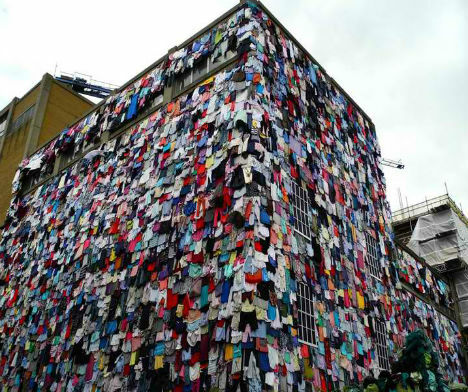 The ‘Shwopping’ campaign involved setting up over 1,200 ‘Shwop Drop’ boxes at Marks & Spencer stores across the UK to collected unwanted clothing. The garments were taken to Oxfam where they could be resold or recycled. This creative architectural art installation is reminiscent of Jennifer Marsh’s crocheted gas station project, which covered an abandoned gas station with donated crochet squares. It also calls to mind ‘yarn bombing’, the practice of adding knitted covers to objects like trees, street signs, shopping carts and – yes – buildings. Check out 51 amazing examples of yarn bombing.